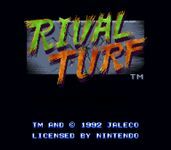 Rival Turf is a videogame developed and released by Jaleco. In Japan the title is Rushing Beat and there its part of a Trilogy, together with Brawl Brothers and The Peace Keepers. Rival Turf is a side-scrolling beat 'em up game where the player controls either one of two characters, both of which have their own specialities. The game supports a two player cooperative mode as well as a 2-player versus mode.